Hiring an accountant to help you with your business, especially when it comes to taxes, can often mean the success or failure of your business. Hiring a certified personal accountant is well worth the investment. Your accountant can make you aware of potentially problematic financial missteps that you should avoid, as well as tax savings that you might not be aware of. When you decide to take the leap and invest in the help of an accountant, it’s a relationship that you should not take lightly. It’s important to know what to ask and when. Asking the right questions means that you will ensure that they help you do what’s best for your business as well as your bottom line. How often should we meet, and how can I get ahold of you? When dealing with your business, and more importantly, your money, your relationship with your accountant is one that requires healthy and open communication. Make sure you know when you’ll meet in person, if you’ll connect via the phone or other platforms as well as in person, and how frequently you will talk. Generally, individuals meet with their accountants weekly or monthly. How are you planning on helping me prepare for tax season? This question is incredibly important to ask. It will reveal to you your accountant’s plan for success for you, which will either show you that they know what they’re talking about, or that they may not be the right accountant for you. Additionally, taxes are confusing and the number one reason businesses hire accountants. They will make the tax preparation process much more straightforward for you, as well as do a bulk of the work for you. Begin discussing taxes long before the tax filing deadline to avoid the last minute rush to get your taxes filed. Part of an accountant’s job is to help small-businesses grow and expand over time. Having a solid financial groundwork established is critical to the growth and overall success of business, and hiring an accountant is a sure fire way to avoid critical financial mistakes. On an ongoing basis, your accountant can also help you identify and hone in on opportunities for growth in your market. How can you help me project my business cash flow? When owning your own business, cash flow should be a priority. However, developing a cash flow model and projections over time is not an easy task. That is what an accountant is for. Your CPA will be able to help you develop effective and organized cash flow projections that give you the flexibility to adjust operations as needed, while helping you survive shortfalls and manage payables. Accounting firms generally provide a range of accounting services. These include assisting with bookkeeping, payroll processing, payroll taxes, and taxes and audit representation. If you are looking for all-in-one, a certified personal accountant (CPA) is your best bet. At Laird’s Tax and Accounting, we specialize in bookkeeping and accounting for your business, however we extend our services to businesses and individuals alike. Are there industry-specific regulations I should know about? There are tax regulations that are dependent upon the industry that you are in. For example, food tax in the restaurant industry is specific to that industry. Ask your accountant about those regulations and what they know about them. In general, subsidies, regulations, deadlines, and changes in regulations have the potential to impact your business greatly.Your accountant will help you avoid paying taxes that you don’t have to pay. What should I consult with you about on an ongoing basis? When it comes to your business, your accountant should be a resource to help you weigh financial considerations when making a decision. They are the financial expert, and in your relationship with them you should be able to trust their guidance. 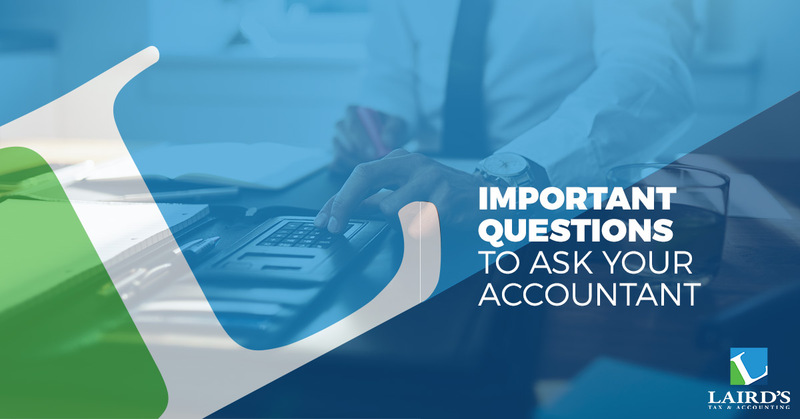 Asking them this question will help you know what specific decisions your accountant will help you make. A good accountant will help you in a way that makes you understand the potential effects of choosing one option over another. When you hire an accountant, make sure you hire the one that will look out for you and your business. The team at Laird’s Tax and Accounting strives to inform you on your company’s financial condition often and work with you to see the success of your business. Our team is accredited by the Better Business Bureau, making Laird a name you can trust. Call us today!